THINGS are very difficult for Leeds United at the moment because you can’t make signings if you don’t know who the manager is going to be. Who the manager is going to be, what their thoughts are on the season, how hard they are going to push for promotion – all those things can determine which players want to sign for the club. But it’s very difficult and no-one seems to know what is going on. There has been no movement with contracts for Lewis Cook or Charlie Taylor and that’s not down to any kind of manager, that’s down to the club getting that sorted out in general. They are a commodity. That is just as important as sorting out the manager, of course it is. Yes, you need to have a manager but you need good players and they are two excellent players. They are going through the England set up in the right way for their age and I’m pretty sure that both of them could possibly be full capped England players. Whoever the manager is, the club themselves and Mr Cellino need to get those two players signed up for next season because I am sure whoever the manager is, whether it’s Steve Evans or someone else, they will want quality players like that. Could we still not know what is going on this time next week? Probably. At the moment nobody knows any different, Steve Evans doesn’t know any different and nothing has been said. We hear rumours of looking at other managers from abroad but if that is the case then we need to make something happen quick. If not, leave it with Steve, let him crack on, he knows what he needs and, for me, he’s done enough to keep the job anyway. Is money going to be pumped in? We’ve heard nothing. We’ve not heard anything about players coming into the club and we know a lot of them have left now because they are out of contract. There’s spaces that need to be filled and there’s money there to be spent. Karl Robinson and John Sheridan are two names that have been mentioned for the head coach’s job but is there any point in getting them in? Probably not. The two of them have got experience in managerial positions but Steve has got a track record and has done well enough at the club. But there’s certain things about the club that need to change and that’s from the top downwards. We have got to get that right. We have got to show the players that the club is run the right way and is going in the right direction. It’s important that we can be proud of the club that we love, and we are proud of someone that is running it the right way. We’ve not had that. Aston Villa have been taken over by Dr Tony Xia and we can all dream of having somebody like that at our club and with those ambitions. I’m just hoping we can emulate that and it doesn’t look like happening with Mr Cellino, not if he isn’t going to come good on the promises he made when he first came to the club – which doesn’t look like happening. It’s been one farce after another and the club has been run shambolically in my eyes, so please sell. Get someone else in there that is going to get this club to where it belongs and back to a club that we can all be proud of again. Let’s start pushing forwards and getting into that Premiership where everyone wants to be but where Leeds United should be. We need to be up there playing against the Chelseas and the Man Uniteds and the Man Citys. We have got the fan base, home and away, and the club’s history is all there to be seen. We need to start making more history. If someone does come in to buy the club then they know they are getting a great club and they know they are getting the fan base. We just need the infrastructure put in place and we need somebody who is going to love the club like the fans love it. We need somebody that is going to take the club forward. History is great, but let’s make new history and let’s start pushing this club forward again and creating new history for young fans to see and enjoy. Mirco Antenucci and Scott Wootton have now both gone and that’s not surprising. For me, Antenucci did okay in bits but he wasn’t consistent enough and I’d like to see the money go to a younger player – money well spent. And somewhere along the lines, if they are really serious about going up into the Premier then this whole wage structure thing is going to have to change one way or the other. Unfortunately, certain players that make a difference do cost more money than others. Players that get you 20 goals a season or 25 cost money and get paid more than certain other players in other positions. 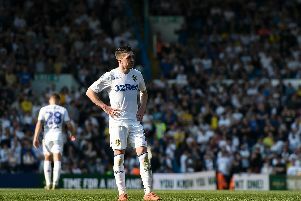 Wootton’s career at Leeds has not been successful but I do feel a little bit sorry for him because he has not been playing in his original position and certain things have gone against him at crucial times. But I’m a little bit surprised that Lewis Walters has not been given another contract. I thought he was somebody that could be a serious contender to start so that’s something I am a little bit disappointed about. I don’t think he has been given enough time and he definitely has the attributes there to be a great player. It’s obviously not to be, so we’ll just have to take that one on the chin.